In most parts of Italy, Father's Day is celebrated on the 19th March, which corresponds with St. Joseph's Feast Day. It is traditionally referred to as "Festa del Papa`" and stems back to early Roman Catholic traditions. As with most traditional Italian celebrations, it is centered around food. 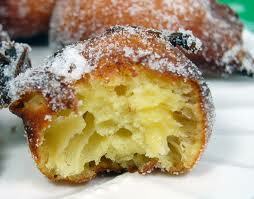 The most notable of the food served on this day, the Zeppole or Frittelle (depending on region) being the most popular. Fathers are showered in gifts and feast on their favorite foods and it is a time for children to show their gratitude! Spoil dad this Father's Day the Italian way with this traditional Father's Day sweet. 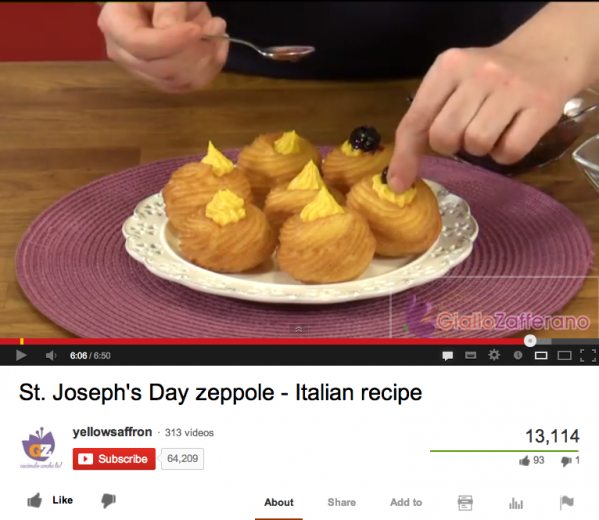 It's called the St. Joseph's Day zeppole - An Italian Recipe. Give them a go this Father's Day! He'll be thrilled! If you are keen to try the Zeppole Recipe, here's another very basic version. Have fun! 1. Combine butter, water, sugar and salt in a saucepan and bring to boil. Boil it for about 10 seconds and then remove from heat. 2. Quickly stir in flour (add gradually though) and mix it until it forms a dough. Return pan to heat for approximately two minutes. 3. Beat in the eggs and the egg yolk, one at a time. Stir until completely blended in. Continue beating for 5 minutes until the dough becomes glossy and thick. Refrigerate for 15 minutes. 4. Heat a saucepan on medium heat and fill it with oil for deep frying. Drop spoonfuls of the batter and fry until golden brown and puffed. They will expand, so don't overcrowd the pan. 5. Transfer the cooked Zeppole to paper towels to drain off excess oil. 6. Sprinkle with icing sugar. Best served same day. Enjoy! *As an alternative, you can fill them with custard or chocolate sauce. There is also a variation using ricotta cheese that you may also like to try. Only one week until entries close for the Melbourne Salami Festa. If you think you can take out this years "Best Homemade Salami", then get your entry forms in. The Melbourne Salami Festa are also holding their first Gala Dinner at Ombra Salami Bar on Tuesday 10th September, 2013. This is going to be an awesome night and not to be missed if you want to learn more about artison cured meats and wine pairing. The night will be hosted by Carlo Grossi and official Festa Judge James Vardis. Tickets are selling fast, so don't miss out! Tickets are also on sale now for the Salami Festa. There will be general admission tickets available on the day, however if you want the ultimate experience of "Master Taster" or "Apprentice Taster", then purchase your tickets On-line to avoid disappointment. And don't forget...We'll also be facilitating a salami-making workshop on the day. So come on down because its going to be a HUGE day!! We're so excited and hope to see you down at the Northcote Town Hall to support this awesome celebration of our beloved homemade salami. March on Salami Army! The trading hours for our Reservoir and Clayton stores are 9am until 5.00pm Monday to Friday and 9am until 1.00pm on Saturdays. Gift Vouchers are also available and make for a great Father's Day gift. You can also shop anytime at our Online Store, with the security and ease of Paypal. You can also follow us on Facebook and Twitter daily updates, specials, events and more. If you're starting your weekend with last minute shopping for Father's Day, then don't look past the new FIAT 500L. It comes with a complimentary Italian family. Great commercial! Enjoy the weekend! And to all the dad's, have a wonderful Father's Day with your family.